Widow Pat Heafield, who moved house to be closer to her daughter after her husband died, has praised UKDN Waterflow (LG) Ltd for the way its team helped her with a drainage problem at her new home. Pat had only just moved into the house in Barton-under-Needwood in Staffordshire, when a soil pipe became blocked, and she could not use the upstairs toilet. She had already been upset because the move coincided with the first anniversary of her husband’s death. Then the drain blockage then made matters worse. A plumber called out to assist mistakenly cut the soil stack, causing an overflow of raw sewage that seeped into an extension to the property below. A drainage company was then called in. Its engineer could not find the precise cause of the blockage, and recommended that the path outside the extension needed to be dug up to investigate further. 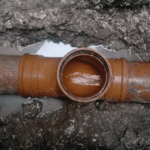 Only when UKDN Waterflow (LG) drainage engineer Mick Wragg was sent out to investigate, was the location of the blockage, and its underlying cause revealed. With diligent and persistent use of his CCTV survey camera and his jetting equipment, he found that the drain blockage was under the extension not under the path as Mrs Heafield had previously been advised. He could also show her on the CCTV camera screen that it had been caused by a build-up of wipes. They had snagged on a joint ring that had become dislodged and was sticking up inside the plastic pipe. It was a problem that had been building up before Mrs Heafield had bought the house. With the location and cause identified, a plan for remedial works could be put in place. Mrs Heafield says: “UKDN Waterflow (LG) were very professional and understanding. Moving house and having the drain problem were upsetting, because they reminded me I didn’t have my husband with me.